Considering the broad scale of materials available today, a collection of innovative projects delves into the wider potential of 21st century production. “Everything is made from something,” Mark Miodownik MBE (b. 1969) famously states in Stuff Matters: The Strange Stories of the Marvellous Materials That Shape Our Man-made World. Miodownik – listed in The Times’ inaugural list of the 100 most influential scientists in the UK – is Professor of Materials and Society at University College in London, and has collaborated with interactive events at Tate Modern, Hayward Gallery and Wellcome Collection. In his forward-thinking publication he notes that, without basic elements such as concrete, glass, metal or textiles, we would be left with nothing. Taking the point further, he notes that each era brings forth a new material that significantly defines the time and becomes integral to its progress. This can be seen through the likes of steel in the Victorian period, or the production of the first skyscraper – which, in turn, created an unprecedented way of living in the city.. Built in 1884-1885 and designed by William Le Baron Jenney, the 10-storey construction of the Home Insurance Building in Chicago paved the way for a new commercial style, using steel to carry the weight of the structure. In the 21st century, however, nanochip technology is influencing everything around us – from smartphones to the buildings with swipe technology. The rise of miniature electronic devices is truly being integrated into society, most notably with the Amazon Go Store that was launched earlier this year in Seattle. Using apps, sensors and swipe technology, the shop requires no human interaction. With thousands of unique substances listed across the globe, Seetal Solanki’s book Why Materials Matter looks to answer the question: “What does it mean to live in a material world?” Published by Prestel, the text, which is introduced by Miodownik’s ideology, creates an impressive collection of projects blurring the distinctions between design, fine art, science and pushing the boundaries of material culture. Given the disquieting scale of both consumption and pollution on today’s planet, a reassessment of how to use objects to our advantage – ethically and responsibly – is fundamental to the research that underlies the publication. In line with the Ma-tt-er mission, Solanki is celebrating these ideas with global audiences as part of a launch at the London Design Festival this autumn. Liz Corbin, a doctoral researcher at London’s Institute of Making and a tutor at the Royal College of Art, who contributed the foreword, also foregrounds the fact that we are never without materials, and as such, the conversations are much larger. “These seemingly mundane fragments and blobs of metal, plastic, ceramic and glass are the stuff from which our entire civilisation is constructed. Yet, perplexingly, whilst they do so much for us, we rarely pause to marvel at them.” The overview of cutting-edge examples which has been chosen for the volume is a perfect opportunity not only to discover the hidden wonders of historical methods or futuristic possibilities, but also to create new behaviours in the way that audiences – and designers – perceive the physicality of the modern world. It’s important to note that visionaries from a variety of industries are looking to address environmental damage, and this isn’t the first text to reference it. 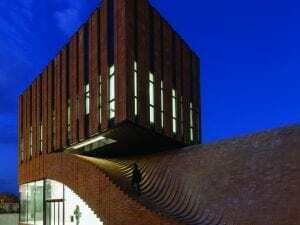 However, the featured projects take sustainability as an integral aspect of design as opposed to a bonus feature. The text employs an extensive and impressive diversity of substances, and concentrates on a wider bank of case studies that range in scope from ancient societies up to today. As such, the impressive presentation has been divided into three fascinating sections. Everyday features mundane, often overlooked substances to demonstrate how they can be transformed, like pine needles into textiles or ancient grain flax into biodegradable chairs. Within this, cork, timber, stone and paper are called upon, as well as food. SILO, a zero-waste restaurant in Brighton is a perfect model. The company in question buys its produce whole from the growers and producers and, as a result, makes use of very little packaging. The additional plastic it does receive is then shredded, melted and reformed in a mould and transformed into plates, which are then used to serve food. Going even further, any food waste is fed into an anaerobic digester that generates up to 60 kilograms of compost in 24 hours. The second part, Sciences, focuses on novel materials created through technical, biological or chemical processes. Charting everything from DNA to rubber and foam, this section taps into the needs of the planet and what can be done to meet them responsibly. Notable projects include synthetically produced spider silk and leather-like fabrics, which are created from bacteria produced by coconut water. The substance isn’t harmful to the environment if thrown away, and also includes no animal bi-products. 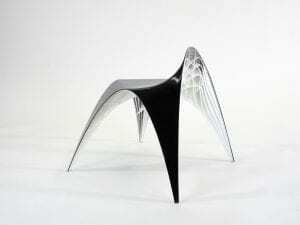 Expansive – the final section – investigates less obvious yet fundamental elements like air, light and water. Whilst “light is not something most of us immediately recognise as a material,” Solanki states, some of the most amazing concepts in the book utilise it in its own right, addressing the ways it is perceived and experienced. This is something that has often been investigated in visual arts – through the likes of James Turrell’s Skyspaces and Olafur Eliasson’s various public projects – but in this case, light is considered for its impact on wellbeing. Rotterdam-based Sabine Marcelis, who runs a studio for installation and object design, manipulates light paths to affect surrounding spaces. 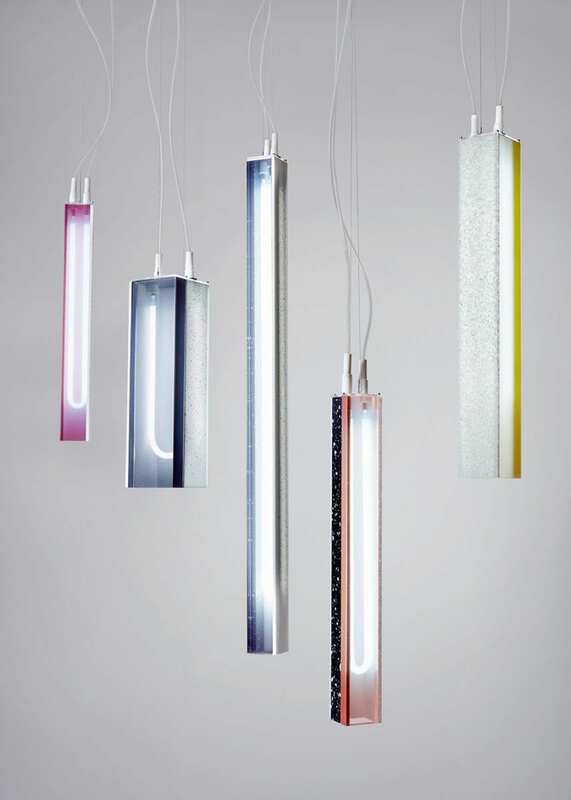 VOIE, for example, is a collection of cast-polyester-resin pieces in various shapes and wide spectrum of colours, which are lit through. The resin’s properties allow the light to diffuse in many ways, thus creating extraordinary visual effects, which enhance the various hues. 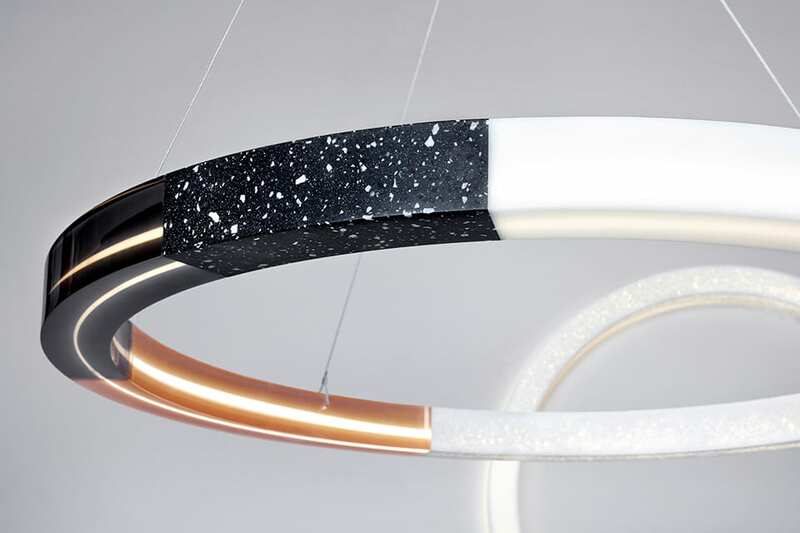 It seems to confirm the designer’s statement, which reads: “Forever in search of magical moments within manufacturing processes to create unexpected experiences.” Not only can the final result be adjusted to the needs of the space, but also Marcelis’ designs work to co-create it, as light circulates across the space and is subsequently reflected in multiple directions. 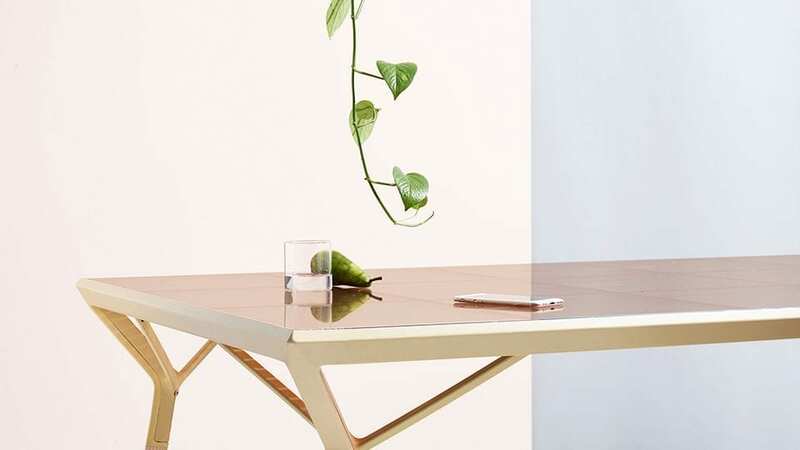 Similarly, innovative Dutch designer Marjan van Aubel, who is currently based in London, has mastered the art of transforming furniture and objects into sources of energy by implementing solar panels into their structures. 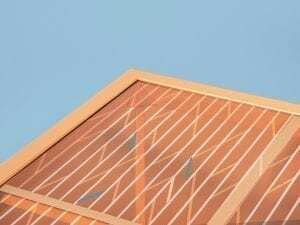 By teaming up with scientists and engineers, van Aubel creates extreme energy efficiency through intelligent design. In 2017, van Aubel was one of the three winners of the Swarovski Designers of the Future awards and co-designed an installation for Design Miami/Basel in the same year. The competition’s goal was to promote crystal as a material. 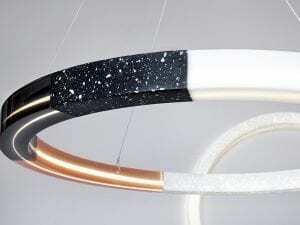 An innovative approach transformed precious stones into a beautiful provider of renewable energy. 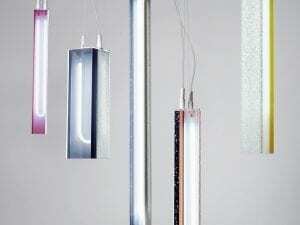 In the Cyanometer (a series of three pendants) solar cells are integrated within crystal elements. Whilst the energy that would be generated in the cells in the daytime could be used as a source of light after dawn, its intensity can vary depending on how much has been stored. That is why it takes the name from the 1789 device – whose invention is attributed to Horace-Bénédict de Saussure and Alexander von Humboldt – designed to measure the apparent “blueness” of the changing sky. 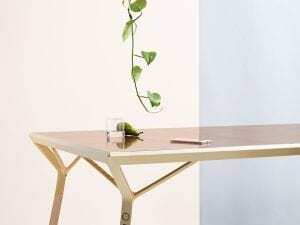 Aubel’s other projects include the Current Table, which has an in-built solar panel surface. 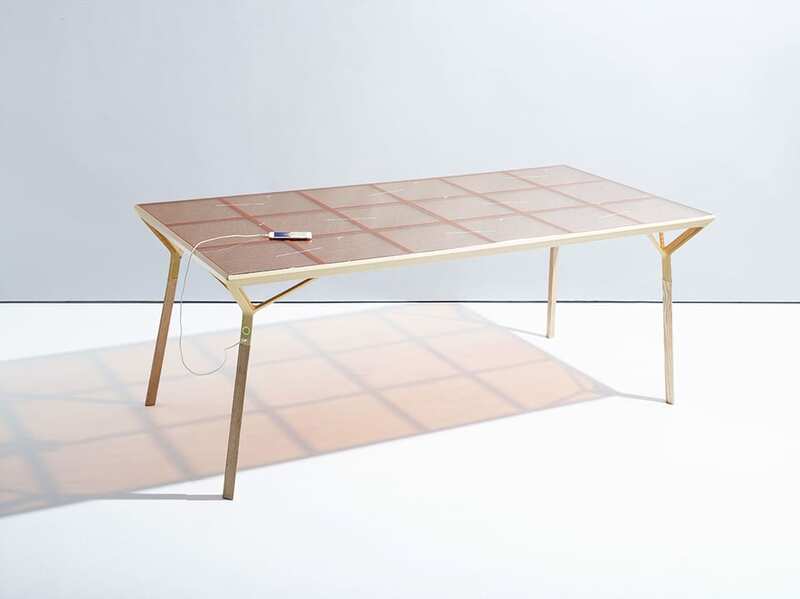 Made of dye-sensitised solar cells, it generates electricity to recharge numerous devices through integrated USB ports located on the side of the table. As in photosynthesis in plants, the technique makes use of the properties of colour to create energy. Last but not least, like all Aubel’s other projects, this ingenious technical solution is not stripped of its elegant appeal. 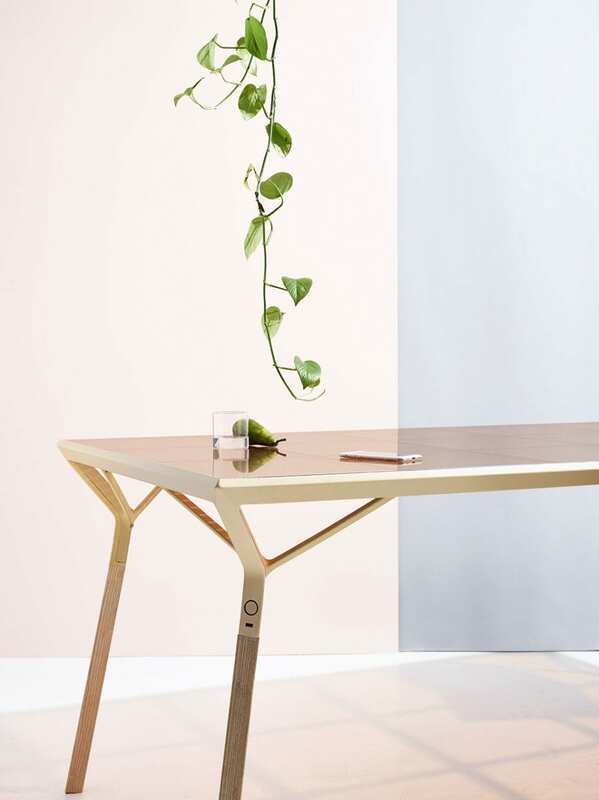 The solar panel sits on a wooden base with sophisticated triangular legs.